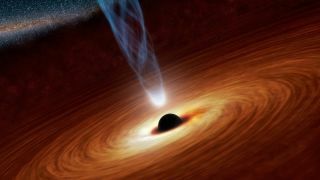 Artist’s illustration of a supermassive black hole. The supermassive black hole at the heart of a recently discovered galaxy is much larger than it should be, and astronomers don't know why. The galaxy, known as SAGE0536AGN, lies about 2 billion light-years from Earth and contains roughly 25 billion times the mass of the sun. Galaxies of this size typically harbor central black holes with the equivalent of 12 million solar masses or so, but SAGE0536AGN's is about 30 times that heavy, weighing in at 350 million solar masses, a new study reports. "Galaxies have a vast mass, and so do the black holes in their cores," lead author Jacco van Loon, an astrophysicist at Keele University in the United Kingdom, said in a statement. "This one, though, is really too big for its boots — it simply shouldn’t be possible for it to be so large." Supermassive black holes and their host galaxies generally grow in concert, but the SAGE0536AGN system isn't playing by that rule. The central black hole may have grown much faster than the galaxy, or perhaps the galaxy stopped growing early on for some reason while the black hole kept gobbling up material, researchers said. "Time will tell whether SAGE0536AGN really is an oddball, or simply the first in a new class of galaxies," officials with the Royal Astronomical Society said in the same statement. SAGE0536AGN was discovered in 2011 by researchers analyzing data gathered by NASA's Spitzer Space Telescope. Researchers think the galaxy is at least 9 billion years old. Van Loon and co-author Anne Sansom, of the University of Central Lancashire in the United Kingdom, studied SAGE0536AGN using the Southern African Large Telescope. The duo measured how fast gas is swirling around the supermassive black hole by noting how hydrogen emissions were shifted by the Doppler effect — the same phenomenon that explains why an ambulance siren sounds relatively high-pitched when it's approaching an observer, and lower-pitched when it's driving away. The speed of the gas is determined by the black hole's mass, so the researchers were then able to calculate that SAGE0536AGN's behemoth is as heavy as 350 million suns. That's pretty big, but it's by no means a record-setter. Some supermassive black holes at the hearts of galaxies contain billions of solar masses. The new study was published online this month in the journal Monthly Notices of the Royal Astronomical Society.